Net Weight: Packet (270 seeds)1/4oz (6625 seeds)(+$7)1oz (26500 seeds)(+$15)1/4lb (106000 seeds)(+$57) This item is currently out of stock! 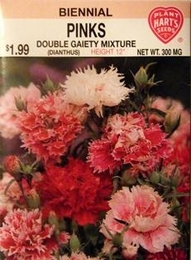 Pinks, although a biennial, blooms from seed the first year if started early. Their double flowers on strong stems, in a rich variety of colors make them especially attractive. They are easy to grow and are excellent for beds, borders or cut flowers. Plants started in July or August do not bloom until second year, a protective mulch or straw or leaves should be used where winters are severe. Keeping the flowers picked will prolong the blooming period. Planting time - 6-8 weeks before last frost for blooms the first year, mid-summer for blooms the following year.